Recycling our waste on the Central Coast is easy and has become a daily activity which has real environmental benefits. When you recycle, you help save important natural resources like minerals, trees, water and oil. You also save energy, conserve landfill space, decrease greenhouse gas emissions and reduce pollution. Recycling closes the resources loop, ensuring valuable and reusable resources do not go to waste. Instead, they are put back to good use, making much less impact on our environment in the remanufacturing process the second time around. Your yellow lid bin is for recycling only. This bin is collected fortnightly on the same day as your red-lidded garbage bin, but on the alternate weeks to your garden vegetation bin. Each fortnight Cleanaway empties your recycling bin and delivers the material to a Materials Recovery Facility (MRF). 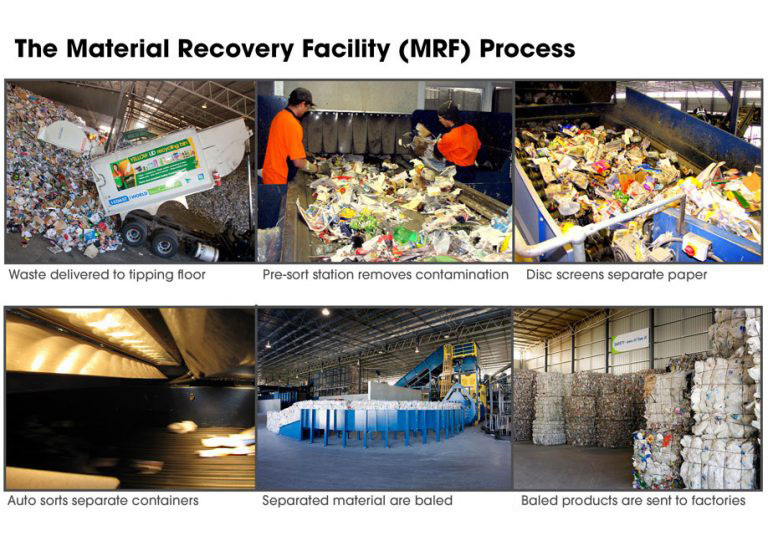 The MRF is a large factory where household recyclables are sorted into individual commodity streams, such as paper, metals, plastic and glass using machinery. MRF employees (called Sorters) remove large pieces of contamination (such as plastic bags, clothing, dirty nappies and food waste) by hand. After recyclables have been sorted and baled they are transported to reprocessing centres both within Australia and overseas, where they are manufactured into new goods.